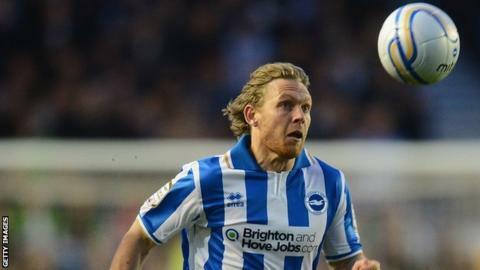 A brilliant double from Craig Mackail-Smith moved Brighton up to fourth in the Championship and left Burnley inside the bottom three. The Scot opened the scoring with a fine effort from the edge of the box, then added a superb overhead kick late on. Burnley had equalised through a Gordon Greer own goal after an hour, as Junior Stanislas's cross skimmed off the defender's head. But the Seagulls' captain made amends with a header two minutes from time. Brighton, unbeaten in their last three games, were one of the busiest clubs on transfer deadline day, but manager Gus Poyet decided not to start with any of his four signings following the 5-1 thrashing of Barnsley. Mackail-Smith had been linked with a move to Norwich during the transfer window but he showed he has not been distracted by any speculation about his future, collecting Gary Dicker's free-kick and firing in from 20 yards for his third goal of the season. There was little other goalmouth action in a lacklustre first half but Brighton nearly doubled their advantage after the break when Ashley Barnes' header was saved by Lee Grant. Charlie Austin went close for Burnley, heading onto the roof of the net, before his side equalised when Stanislas's vicious cross proved too difficult for Brighton to deal with. The hosts almost took the lead when Ross Wallace sent in a powerful drive from 35 yards, but Tomasz Kuszczak tipped it over. Brighton were denied a goal when Grant saved from Mackail-Smith, but there was no stopping the Scotland international's acrobatic effort 13 minutes from time. The points were secured when Greer met Andrea Orlandi's cross, leaving Grant with no chance.